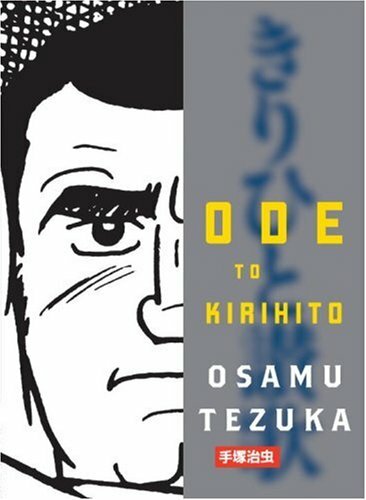 A little while back, Katherine Dacey sent me a copy of Ode to Kirihito Part One. (Thanks again, Kate!) It was pretty daunting-looking at first, clocking in just shy of 500 pages, but it was by Osamu "Father of Manga" Tezuka, so I was keen to dive in anyway. The story starts in a hospital with several high-ranking doctors examining a patient with a curious ailment. His body has been wracked by distorting bone and muscle structure, and he's essentially transforming into a dog-like creature. The toll is too much for the human body to take and, to date, all known patients have died. Though the head doctor is convinced the disease is somehow contagious, the protagonist -- Dr. Kirihito Osanai -- firmly believes otherwise. He leaves the city to trace the source of this rare malady. I was was quite struck by the story. Kirihito had largely discovered the source of the disease in just over 100 pages and Tezuka had, by that point, established a number of different plot elements that could be carried out. However, I couldn't see how he could carry the story out for another 900 or so pages. (This is only volume one, you'll recall.) One hundred pages later, I realized what I had forgotten before -- namely that Tezuka is a master storyteller. He had, by that point, added several clever plot twists and turned the story down any number of paths that, while they made complete sense, struck me as quite unexpected. Which is, of course, what any good story does! The art throughout Kirihito is superb. I really enjoyed seeing Tezuka work the style of illustration to good effect throughout the story, frequently utilizing his pen- and/or brush-work to emphasize moods and emotional states. And the scenery shots were absolutely breathtaking! If there was ever any doubt of Tezuka's mastery of craft, this will dispel it. One thing I found particularly interesting from a historical/cultural perspective was also my one disappointment with the book. Tezuka began work on this in the late 1960s and, as such, it bears the cultural hallmarks of that time. Notably, the social interactions between different races and genders viewed though a Japanese lens. There's some very clear indications, in particular, on how women were viewed in Japan at that time and, to Tezuka's credit, some highlighting that attitude in -- what seems to me -- an attempt to show just how ignorant it was. It's not preachy, by any means, making it all the more laudable. However, Tezuka's depictions of other races -- especially Africans and Chinese -- are much less forgiving. And while that might be at least partially understandable from the time period this was written, he makes a point of calling out a decidedly racist attitude of an American towards the Japanese but then, as a creator, applies a similar racism towards his depictions of Rhodesians, who all appear in blackface. Fortunately, they're not also given to stereotypically black attitudes and mannerisms, but the depiction itself is jarring. It's a minor point of the story, but stood out to me as fairly glaring, again, in light of just having commented on racism towards the Japanese only a few pages earlier. On the whole, though, the book was very well-executed. Good story, good pacing, good characters, good illustrations... there's very little not to like here. I'll definitely be picking up Part Two when I can.